Paul Strassmann’s blog: 030. Where Should Retired Seniors Keep Their Assets? 030. Where Should Retired Seniors Keep Their Assets? 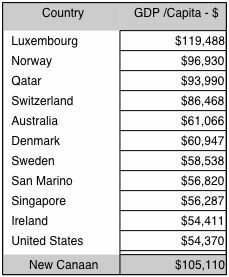 When various countries are ranked according to GDP/Capita, of Income/Capita (for New Canaan) it appears that where wealth is located a residence would be preferred. The following is a ranking of attractive countries that take political stability and a legal regime as preferred locations. Though retirees may prefer isolated locations, such as islands in the Pacific or in Latin America, general prevailing political conditions would have excluded such locations from a preferred ranking.